After much persistence, Dave catches ... something! "I didn't have much money, so I just had to try things until I could get something to work." It's a recurring theme from Dave, told with a self-deprecating smile and a shrug of his shoulders. The guy doesn't give up; it's part of what makes him so likable, and, eventually, successful. We met fellow cruiser Dave when he was on his way back from the store with Rum Cay local Bahamanians Marco and James (see prior post to meet them). They'd helped Dave find a pot. He needed to replace the one he burned when was so tired the night before, he was awaken by the scent of his own smoldering food. That was after enjoying a fine cracked conch and frys dinner from Marco and his girlfriend Shawnee, followed by drinks and shooting pool at a local spot. We'll give Dave major credit to be smart enough to know the right thing to do was to clamp a lid on the pot, so's not to fan the flames. "Even a sand scrub wouldn't clean it," he admitted a trifle ruefully. What is this thing? Is it edible? 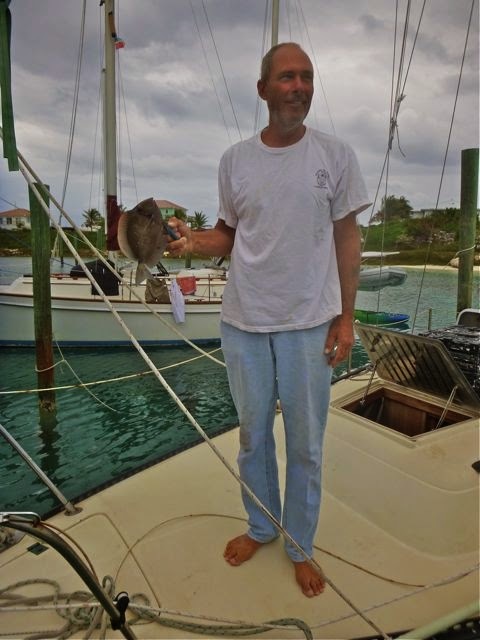 Then there was the time in Nassau when Dave dove in 50 knot winds to untangle the anchor line that jammed when another cruiser not just dragged anchor over his, their chain cut Dave's anchor line. Dave... and his boat survived and he even later recovered his anchor. Even though Dave's anchor dragging neighbor gave him his car rather than his boat insurance info, his car insurer connected Dave with the right folks. Dave got reimbursed. 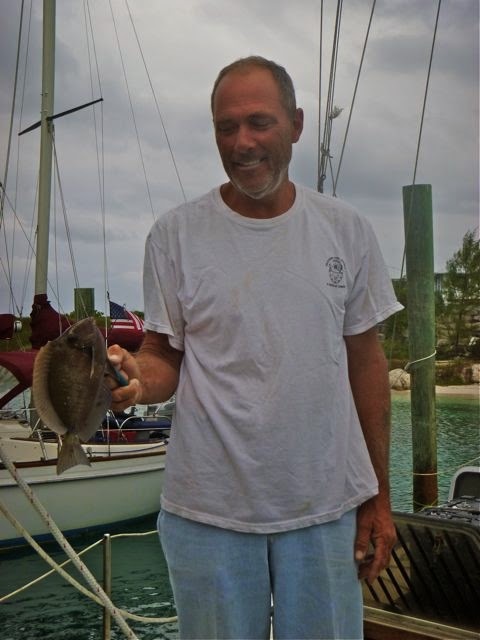 So when Dave kept seeing the fish under our boats in Rum Cay's Sumner Point Marina, well, they were ultimately no match for Dave's persistence. Eventually, after trying a host of poles, lines, lures and bait, he hooked a fish, on buttered corn! "Here. Take this. I've gotta go," Dave said, handing me his prized catch. "Got some black crabs to catch with Fireman [another Rum Cay local who took a shine to Dave]. Don't want to be late!" It's a porgy. Edible? Yes, quite. Delicious, even! Heck, if Dave could be that persistent in catching a fish, then generously giving it up, then I figured I could learn how to fillet it. There was only room for improvement after my first fillet," a 4' mahi mahi caught while underway (sailing). 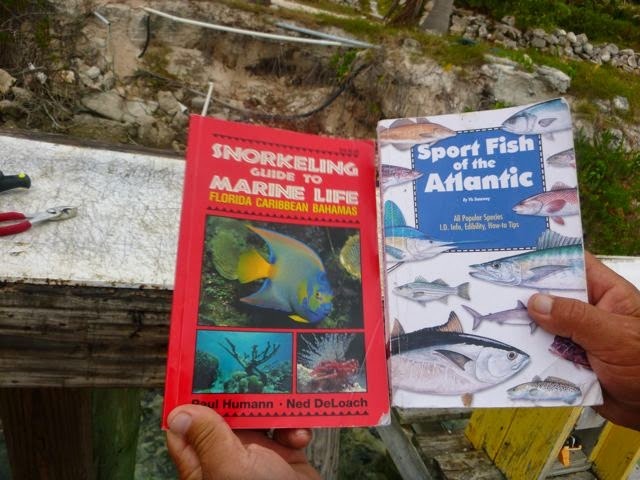 Better yet, Rum Cay's Sumner Marina had a fish cleaning station, and using a couple fish reference books, neighboring cruiser Paul identified Dave's catch as a porgy -- edible! When Dave and Fireman returned, I was ready cook his already filleted porgy. I dipped it in a seasoned oil mixture (olive oil, garlic, chipotle in adobo, thyme. salt, pepper and lime juice), dredged it in cornmeal and pan fried it in olive oil. Dave ate one half and gave Fireman -- who approved -- a bite. I ate the other half. It was good. Then Dave tossed the porgy skin overboard and the marina critters came to life! one of someone else caught and filleted it. Getting a bit cockier, with Fireman's encouragement, Dave used first another porgy he caught, then a remora (shark suckerfish) to try to catch a shark. This time, the sharks won, with a flick of their razor-sharp fins and tail. They took Dave's bait and leader, twice. After a goose egg's catch spearfishing, the next day (I went with the intent of seeing Dave demo how it's done) Dave decided to try to land a shark again... with another remora he caught, then came to his senses. "Tightwads on the Loose" author Wendy Hinman jokes that she caught more fish being nice than with a rod and reel. Considering we met Dave because Marco liked him so much, he cooked Dave a conch dinner from the conch Mario caught, Dave will be kept in fish both as gifts and due to his persistent fishing efforts. "If only I liked fish.... I'll learn...."
Yes, Dave, no doubt you will. We wish we weren't headed in opposite directions, because if we do get lucky fishing, we'd happily share with you, any day. We know you liked that mahi, ... even the porgy, and of course, properly prepared, the conch, too. April 14, 2014, BAHAMAS. 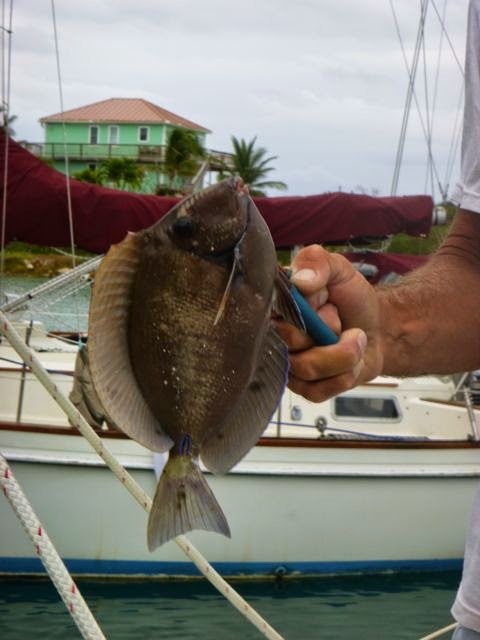 This blog was written and scheduled to post from Sumner Point Marina on Rum Cay (N23.38 W74.50). Most likely most likely we'll be enjoying our third day at Conception Island -- by the time this posts though it may be a few days before another post. Conception is unlikely to offer internet.